Atherosclerotic cardiovascular disease remains the leading cause of death and disability in the industrialized world, despite substantial declines in cardiovascular disease mortality during the last three decades. Cardiovascular disease is becoming common in some developing countries. Many contributing causes of atherosclerosis have been well-characterized, and prevention programs aimed at modification of risk factors have demonstrated benefits in reducing cardiovascular morbidity and mortality. 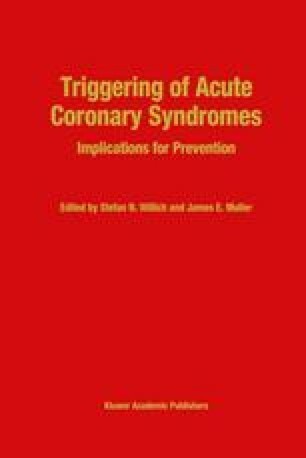 Identification and modification of the triggers of myocardial ischemia and infarction is a relatively new concept. The potential impact of programs aimed at modifying triggers must be considered in the context of existing prevention programs.